When you glance out the window in New Hampshire today, you might think, except for birds visiting the feeder and birdbath, it’s a dormant snow covered landscape. But that would be wrong. There’s a lot going on beneath the blanket of white stuff, a secret ecosystem under there that’s alive and active. The small space between the earth and snow, called the subnivean zone, is where the temperature remains a constant. It’s an insulation area not only for small species of animals and plants, but for microbes that fertilize the soil. These miniature creatures absorb nitrogen from the snow and from decomposing plants… like all those fall leaves covering your borders… then they die as the snow melts providing the nitrogen that our garden plants need to grow. About 6-8 inches of snow is needed to maintain a good insulation area under the snow. We’ve come close this winter with fresh snow covering the old. It recently snowed overnight, a light snow covering the bunny in the photo above taken the day before. When temperatures rise and there’s a thaw, small tunnels in the subnivean zone are visible. I just hope these little critters, voles, mice and other animals, are gathering sunflower chips sprinkled for the birds, and not after tender bark of my shrubs and trees. Maine. What’s the appeal? Maine’s rocky shorelines dotted with sandy beaches draw thousands of vacationers to Maine. And then there are folks like us who are drawn to the dozens of fresh water lakes where rustic camps dot the shoreline. Bliss for me is watching a thick fog roll in over a lake waterfront while sipping a morning cuppa joe. Coffee could be followed by a morning paddle through the fog, the only sounds being the paddle dipping in the water and the not-so-distant call of the loons. In this tranquil setting, this could be the most exciting thing you do all day! Our summer stay was on Thompson Lake, a seven-square mile lake surrounded by beautiful mountains. The lake is in the top 5% of the cleanest lakes in Maine. On our boating expeditions around the lake, we could see the bottom at about 30-feet deep before we headed out into areas where the depths were close to 120-feet deep. Both in deep waters and around the parameter of islands were prime spots for the grands to try their hand at first-time real (or reel 😄) fishing. A lake fished for bass, salmon and trout, all our small fishermen caught were little sunfish that were all released to see another day. It was not uncommon to spot a bald eagle on one of the many islands or hear the echo of loons any time of the day. With a reported 20 pairs of loons breeding on the lake, we felt fortunate to have a pair with their tiny offspring foraging in a cove near our camp daily. What a sight to see! Days were spent doing whatever we pleased. That could mean doing nothing at all or it could mean a venture inland. Unlike the summers of my youth on the salty shores of our grandparents’ rural cabin in Virginia where siblings and cousins played cards or Monopoly to pass an afternoon, this generation has modern options for afternoon lounging. All good…. Evenings were spent enjoying all the traditional summer activities….sitting on the dock, listening to the loons, watching sunsets, and toasting marshmallows over an open fire. I think I’m sold on these rural lake camps of New England where nature abounds. It seems each summer we are on a different lake but it’s all so similar…. quiet, tranquil where nature rules and we are allowed to enter and absorb it all for a short time. It’s still August but I’m learning just how short the growing season is in New Hampshire. Summer is fast shutting down. I don’t mean seeing preseason football on the telly or all those fall decorations I’m seeing in stores. It’s the plants and nature that are showing signs of ending their cycle of growth. Our tomato plants look ratty but there are a few pink ones still hanging on. I’ve been picking the green tomatoes that are certain not to ripen. I’ve sliced, breaded, and fried them up in bacon fat as my southern roots dictate. If you’ve never tried this treat, you’d be surprised at how tasty it is. mister gardener, born and raised in Ohio, once turned his nose up at this delicacy but now can’t say not to this treat. I think we’ll be eating more as the month comes to a close. On a drive through Vermont last week, we noticed a few species of trees are beginning to show color. In our garden, our Little Lime hydrangea shrubs are entering the color phase of late summer and fall. The booms emerge green in the spring, turn white through the summer, and finally present a lovely blush of pink in the fall. It’s happening now and it’s beautiful. The crickets, grasshoppers, katydids, and cicadas are sounding the calls of fall. It can get noisy out there this time of year. Spider webs are festooned across much of what grows in the garden… and with egg sacs full of little “Charlottes” ready to greet the world in the spring. We’re seeing the birds begin to gather for their annual migration. Several of our male hummingbirds have already left. It seems early for migration but the number of males around the feeders are fewer. We are keeping the nectar fresh for the females, the young, and those few that may wander through during migration. The nuisance around the nectar these days are the yellow jackets….. not a bee, but a pesky wasp that is drawn to sweets as the summer wanes. The sun is rising a little later and setting earlier these days bringing some refreshing cool nights. We’ve dragged out the down cover for those nights that drop into the 50’s. I wish this time of the year lasted longer. It’s amazing to think the first frost in this part of the state can occur in less than an month! Summer 2018 in New England has been as glorious as I can remember since moving here. With so many areas suffering the most catastrophic conditions imaginable around the globe… from heat and drought, floods and tornadoes, volcanoes and fire…. we are swaddled in comfort with enough moisture, sunshine, and pleasant temperatures that I feel almost apologetic writing about it. 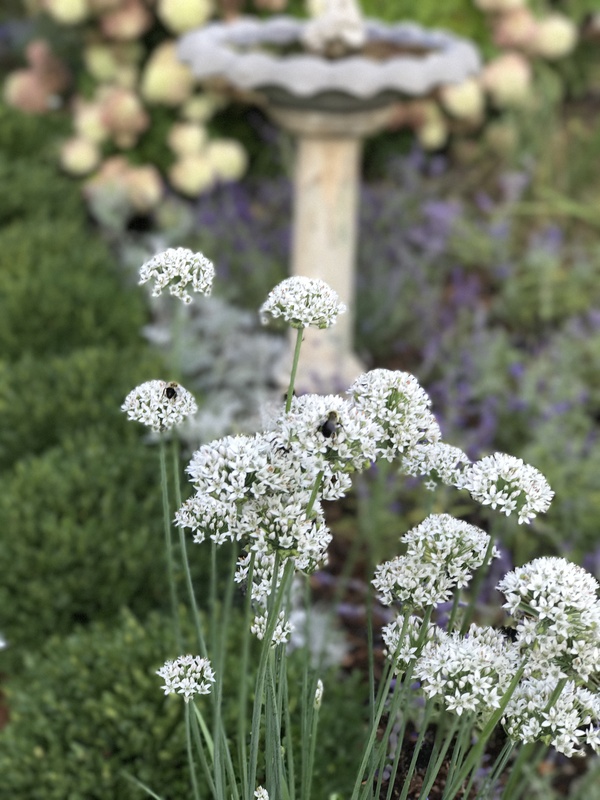 We had a stretch of dry weather earlier in the summer and have suffered in the past with an abundance of weather extremes but, so far… summer 2018 has made the living enjoyable for gardeners and outdoor enthusiasts. With a warming climate, all summers won’t be like this so we will savor it while it lasts. Plants that we trickled water on for survival during a 3-year drought are now bursting with growth. Every shrub and tree and flower and vegetable in this yard is fuller, taller, and more floriferous. With these favorable conditions, we’re seeing more insects and birds and in our yard… especially the Ruby-throated Hummingbirds that have proliferated wildly around here. We now have the adults and their offspring jetting through and around the garden performing acrobatic maneuvers to guard their territory. With such movement, it’s impossible to count how many hummers are out there but there’s a way to guesstimate, according to bird banders. Count how many you see at one time and multiply that number by 6. That would mean there are about 20-25 hummingbirds coming and going and perhaps almost parting our hair when we get too close to the action. Other residents in the neighborhood feed hummingbirds so they are moving between our homes. It’s fun to see such activity and much better numbers than the total 8-10 we counted during drought years. We have the feisty males with their bright red gorgets displaying territorial rule and their mating prowess but the feeders look to be dominated by females with the white throats. That can be deceiving. There are more females than males but the young males we are seeing have not developed their telltale ‘ruby’ throat. They look much like females until we are close enough to see faint lines or striations on their throats. Next year, they’ll display their bright gorgets. We’re keeping the feeders spotless, making fresh nectar (1 part sugar to 4 parts water) often and just watching as the hummers are bulking up preparing for their long migration at the end of the summer. Males will leave first, followed by females and young. We will keep the feeders clean and half-full with fresh nectar after they leave because you never know when a migration straggler will venture by and need a couple of days of nourishment before continuing on. It rained off and on today… a lovely light rain. I wouldn’t want rain every day on vacation but today it was a welcome change. Clouds began to roll in yesterday and I took the opportunity for a beach walk before the heavens opened. It was a solitary walk. I had a mile of beach all to myself… well, almost all to myself. There was plenty of bird life on the shore, in the air, and riding waves. But that wasn’t all. There was life from the sea caught on shore at low tide. The beach was littered with keyhole urchins or sand dollars, small animals that can’t live for very long out of water. These weren’t the white sand dollar skeletons you see sold in souvenir shops. These dark sand dollars could still be alive and they aren’t for collecting. There is hefty $500 fine for taking any live animal from South Carolina beaches. To make sure they were alive, I gently turned each over and touched the cilia, the fuzzy hairs beneath. Thankfully, the cilia moved on every one and all the animals I came across were returned to the water. It was a very good day. At dawn today, a dense fog rolled in before the rain. I could see nothing on the water but could hear motors and foghorns as boat traffic navigated the sound. What a treat it was to sit outside with morning java and watch the condensation change the look of everything in the landscape. It doesn’t have to be sunny to be beautiful! I have been reminded of all the negatives of these animals. I know they damage plants. I know they eat herbs. I know they girdle woody plants in the winter. I know they multiply…. uh…. like rabbits. But this rabbit, our cute little bunny, was special. For the most part, we don’t interfere with the natural laws of nature and allow things to take its course around the property. I might chase off a pesky house sparrow trying to move into the bluebird house or save a butterfly caught in a web from becoming a spider’s supper. But then it all changed when we accepted a tiny bunny onto the property. It was early spring when I noticed a teacup-sized bunny moving slowly toward a clover patch in the lawn. It looked barely old enough to be weaned and it was beyond cute. It seemed unconcerned that I was standing nearby and I wasn’t going to shoo it away. Rabbits don’t seem to last long around here since we have hawks and owls, neighborhood dogs, cats, we hear coyotes at night along with foxes, and then there are those elusive fishercats and, of course, the humans. Despite the odds, bunny survived the warm months and grew healthy and plump on our untreated clover. He proved extremely well-behaved and NEVER ate from the garden. All summer long, the little fella kept the lawn’s clover patch in check. In time, he grew oblivious to having me work nearby and would stretch out in the shade and doze just feet from where I was pulling weeds or digging in the dirt. I moved wheelbarrows, rakes, pruners and hoses around the yard and he would occasionally sit up and watch but went right back to his meal or his nap time with lazy yawns. Once in a while, something would snap and he would go on a tear, darting around in circles, kicking up grass… almost as if he was letting me know this was his yard and was allowing me to visit. I have dozens of cute and amusing iPhotos of the little bunny. Each night as we sat down to dinner, mister gardener and I would watch out of the window waiting for him because our dinner schedule was his dinner schedule. He would appear, hop to a clover patch beneath the window where we could watch him dine as we dined… just inches from the parsley and lettuce in the herb garden that he totally ignored. We never knew where his den was or where he went at night. As cold weather set in, the bunny finally disappeared. We didn’t see him for a couple of months and we assumed he had become a meal for a hungry animal or had snuggled into his den for the winter. Just imagine my surprise when I went out to feed the birds last week and there he was. He had reappeared in a snowstorm in subzero weather. Not for the clover, of course, but to share what the birds are eating. Now that I’m putting out nuts, berries, seeds, and fruits for the birds, I’m guessing some of it has become sustenance for our bunny. Let’s hope there is enough to sustain him during the harsh months and he does not resort to nibbling on the bark of my shrubs! Be safe, little one! Hope to see you in the spring! Can you tell how cold it is in winter by looking outdoors at your rhododendron? Locals in New Hampshire tell me that a quick glance out the window will indicate whether the temperature has dropped to 32° or not. When the temperatures drop to freezing, the normally horizontal rhododendron leaves begin to droop and curl. The amount of droop and curl does correlate to the severity of winter temperature. The lower the temperature, the tighter the curl. At 20° they are curled as tight as they can possibly get. Our rhododendron leaves are drooped and tightly curled right now and that’s a clue to the frigid outdoor temperatures…. a -8° at daybreak and currently a -3°. But why do the rhododendron leaves droop and curl in the first place? Theories and debates abound. Some say it is to prevent branch damage from the snow load. 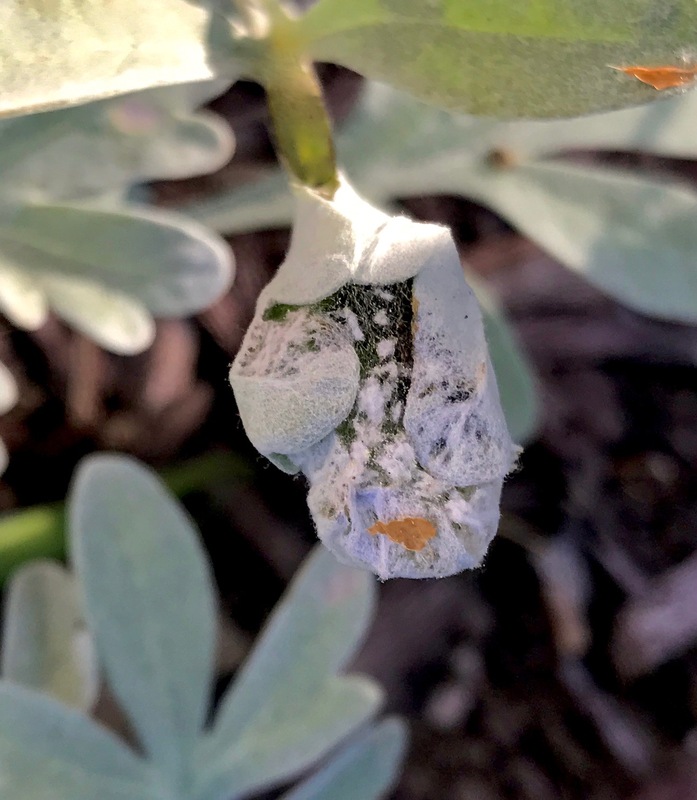 Others theorize it helps prevent or reduce water loss in the leaves, although horticulturists and scientists dismiss this theory because the openings on the underside of the leaf are closed during the winter. A likely reason is drooping and curling prevents rapid freezing and thawing of the leaves. If the leaves are horizontal as they are in warm months, thawing may occur on a sunny day in winter, then the leaves may quickly freeze again overnight. This quick freezing and thawing could destroy leaf cells. So possibly, the drooping and curling would be nature’s way to protect leaves from the thawing solar rays during the day. They are better off staying frozen until they can thaw slowly. More study is needed to answer all the rhododendron leaf questions but I’m just happy to know I can rely on these magnificent shrubs to let me know when the thermometer hits 32°. We’re back from the mountains! The leaves were not quite peak color in higher elevations but still breathtaking to us. On our return, we found very little color on the Seacoast of New Hampshire. However, there was one understory tree that we enjoy from our window each fall that greeted our homecoming with bright yellow leaves. 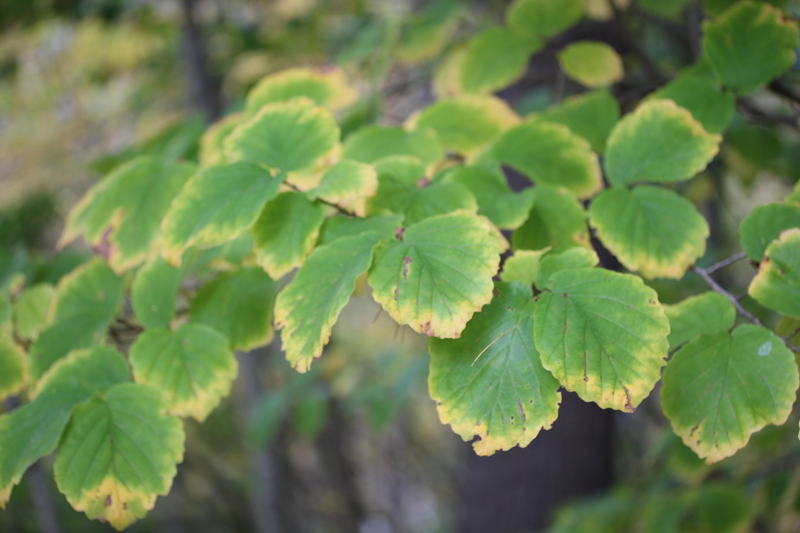 It’s the native witch hazel (Hamamelis virginiana) that grows along our woodline. 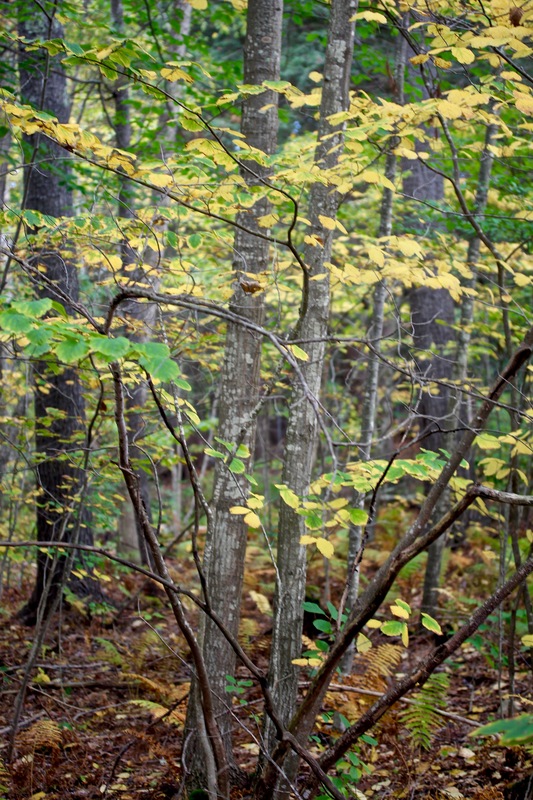 Step just inside the woods and there’s a riot of witch hazel turning yellow as far as one can see. The leaves first begin to yellow from the outside edge in. They eventually turn a lemony yellow before slowly turning brown from the edge again. The leaves soon fall but the tree still presents us with another colorful performance. 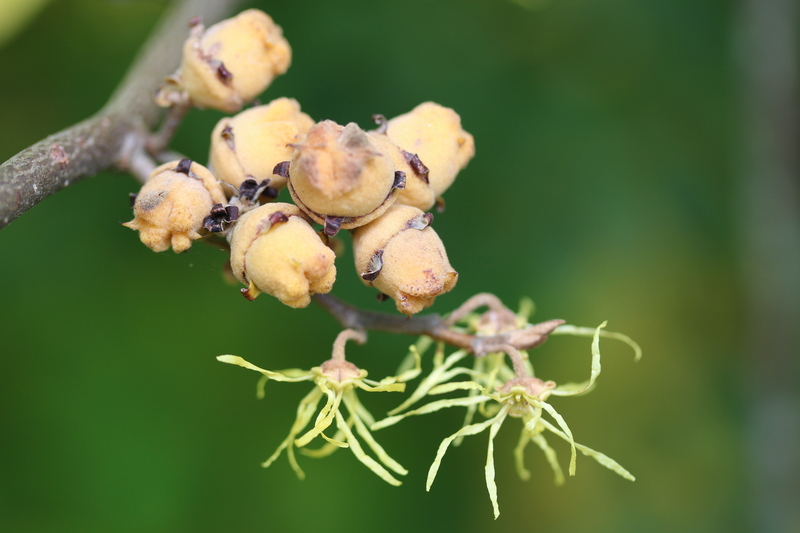 With most deciduous trees bare, the witch hazel’s yellow tassels brighten the fall landscape. This is the only tree in North America to have flowers, ripe fruit, and next year’s leaf buds on its branches at the same time. While the blooms are open, last year’s seedpods reach maturity and loudly eject one or two tiny black seeds per pod 30-feet or more. If left undisturbed, the seeds will germinate in two years. On some branches, I can see year old pods open and empty… however every now and again, I spot a seed that didn’t eject last year. I wonder if these old seeds are still viable. It’s time of year for Halloween witches and goblins so you might think the holiday has some connection with the witch hazel tree that blooms at the same time… but not. The root of the word witch comes from an old English word, wice, meaning pliant or bendable. As lore goes, this tree produces the branches and twigs for divining rods that can locate underground water sources. Oh what an interesting and often overlooked native tree for the landscape! 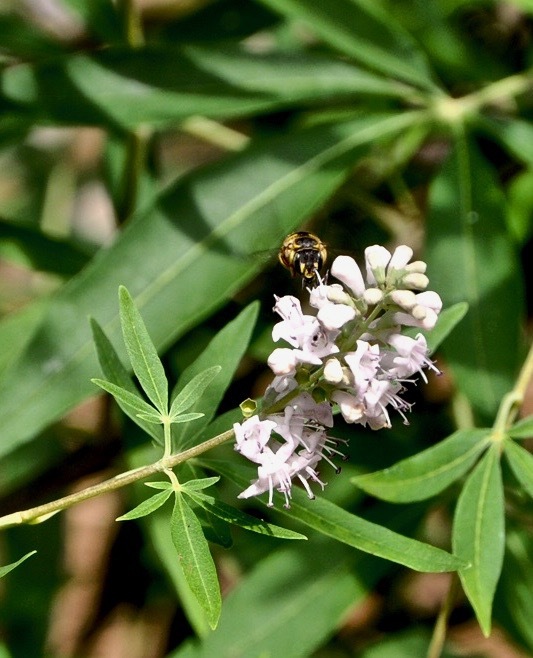 Do consider this native one or one of the many cultivars if you are looking for a fall blooming woody plant to enhance your property. In our quest to learn more about New England, we visited the Shaker Village in Canterbury New Hampshire… and what a trip it was! The remarkable Shakers evolved from the Quakers and split off into a new line in 1747. Ann Lee of Manchester England, a member of the new line, sailed to America in 1714 to become the founder of the American Shakers. Mother Ann Lee was believed to be the embodiment of Christ’s Second Appearing. Nineteen Shaker villages were eventually created in the Northeast, Ohio, and in Kentucky. Our first stop on our village walk was the Infirmary where we met our knowledgeable guide, Kevin, at the entrance. We learned from Kevin that the Shakers officially called themselves the ‘United Society of Believers in Christ’s Second Appearing’ but were named the ‘Shakers’ by the people of the ‘World’ (that’s us) because of their shaking and trembling at worship that eventually evolved into dancing. Kevin was enjoying an apple from the nearby orchard while we chatted. He encouraged us to pick and eat an apple, too. No pesticides or herbicides… quite delicious… but maybe a worm or two. The Shakers embraced change. The infirmary was modern and up to the date with equipment and knowledge and medicines. We saw the surgery complete with anesesthia and, of course, electricity. The New Hampshire Shakers owned one of the first cars in the state and had electricity in the village while the state capital building was still burning gas. They had telephones in 1898 and owned a radio by 1921. How about that?? In 1792, the Canterbury Shaker Village was officially established on 3,000 acres of donated land and it prospered. With our map in hand, we toured and/or identified dwelling houses, the school, shops, the laundry, the stables, carpenter shop, spin shop, fire house, the infirmary and more. This village flourished due to their devotion to Mother Ann Lee’s doctrine, “hands to work and hearts to God.” In their self-reliant communal living, they were successful in enterprise after enterprise, becoming prosperous by their ingenious inventions and quality manufacture of furniture, boxes, baskets, clothes, sweaters (for Harvard!). They were excellent gardeners who sold herbs, seeds, etc., livestock breeding, mills, medicines, and they were ambitious marketers of all they produced. They sold locally and they traveled widely to market their quality goods, routinely visiting grand resort hotels. A famous Dorothy Cloak, designed and made by Sister Dorothy at Canterbury, was worn by Grover Cleveland’s wife to his inauguration. Among Shaker inventions were the clothespin, the circular saw, the flat edged broom, and from Canterbury, a steam-powered washing machine, models of which they sold to hotels. They built over 100 buildings here, each for a distinct function. Today two survive from the 18th century and you will find 25 buildings that are original. Only 4 are reconstructions. With their self-reliance they attracted many. They strived for simplicity and quality in all they undertook to create a ‘heaven on earth.’ Through their communial life, they honored pacifism, gender equality, confession of sin, and… celibacy! Men and women became brothers and sisters as Shakers. To grow, they embraced new converts and took in children, mostly orphans, who were raised, educated, then asked to choose whether to sign a covenant or leave at age 21. If they decided to leave, they were supplied with what they needed for their chosen craft, we were told. At their height in 1840, there were 6,000 believers in America, but life began to change after the Civil War. Jobs became more plentiful in the post-war economy and men began to leave. Slowly the Utopian life of Shakers faded… but in Maine, there are still two surviving active Shakers practicing and inviting in visitors. We loved the handblown panes or ‘lights’ in windows! How about this machine? The Canterbury sisters and brothers must have been thrilled to own this KitchenAid mixer (below), followed by an electric refrigerator, and a Maytag washer. Only the best! My own sister will be happy to know that I bought a Shaker flat broom for my kitchen. When we chatted on the phone a while ago, our conversation turned to cleaning house… as sister conversations might. She sweeps her kitchen nightly and was surprised that I vacuum our kitchen, only using a broom on the garage floor. Hey sis…. I’m now a happy broom convert. I love my Shaker broom as does my kitchen floor. Check out these hand hewn beams in the North Shop! Click for a closer look. Lunch took us to the Horse Barn for tasty soup and sandwiches. Beautiful Shaker furniture indoors but on this day everyone ate outdoors beneath blue skies…..
….where gardens a’buzzin with bees provided a backdrop. The Shakers wrote thousands of songs. Can you hum the tune to this familiar Shaker Dancing song? If so, you might be humming it all day! ‘Twill be in the valley of love and delight. Till by turning, turning we come ’round right. I make a concerted effort to attract bees and other pollinators to our garden. This year, I spent a little more time trying to entice bumblebees to nest in the yard. I already supply a continuous food source during the growing season but I read up on what a bumblebee needs for a nest.I saved dried leaves and grass, and in a corner behind a fence where the soil is dry and shady, I piled the grass clippings and leaves early in the spring. And, lo and behold, one day I watched a large bumblebee arrive, zigging here and there, flying around and around the leaves and fence for a couple of days in the cool spring. At first I thought it may be a carpenter bee attracted to the wood fence but, no, this plump bumblebee was eventually crawling around the leaves. She was a bumblebee queen! She liked the site I prepared and she proceeded to build a nest, lay eggs and, raise her young. Now, late summer, we have a population explosion of beautiful bumblebees that forage from dawn to dusk. We watch them fly in and out of their cavities in the ground. The nest has been enlarged and there are different entrances now… the main entrance now just a foot from the faucet and hose, but they are unconcerned by my presence. I never bother the nest and they just buzz around me and on to the garden. In and out, in and out, all day long. I work along side the bees in the garden. They fly around me, move when I’m tending to a plant, land on me, rest a bit, then fly to the next flower. No stings! Bumblebees need a continuous food source and we supplied a gap-free nectar source in our bee friendly garden. 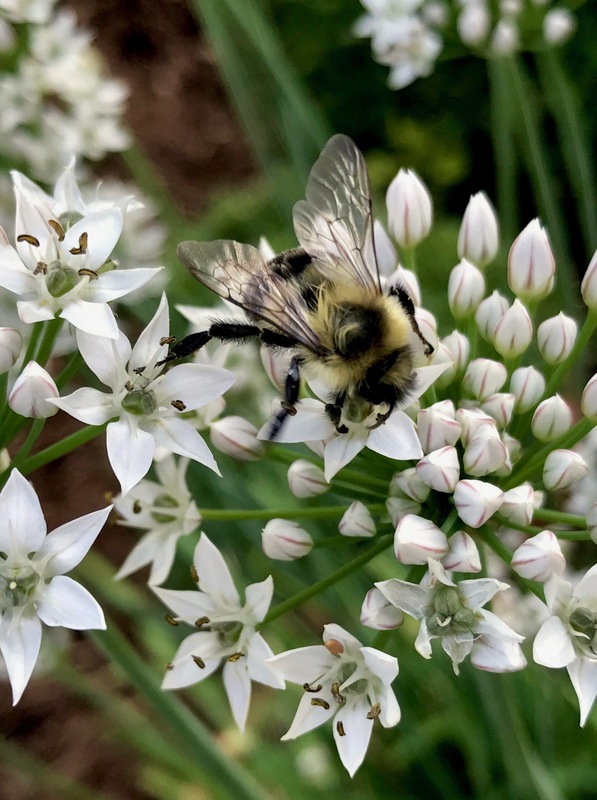 Bumblebees do have a preference for certain flowers and we took notice and made sure we had enough of their pesticide-free favorites all growing season. The bumblebees pollinated our blueberries, were all over the clover, and the only pollinators I saw on our tomatoes. They loved the early crabapple and rhododendren blossoms, the summersweet, the allium, hosta blooms, hydrangea, and all the herbs in bloom. Right now it’s all about the garlic chives and Russian sage, but any moment, the showy flowers of Aralia ‘Sun King’ will open and it’s goodbye chives! It’s been a “buzzy” summer garden but the season is winding down and changes will be taking place. Only the newly mated females will survive the winter, usually beneath ground. The rest of the colony will die later this fall. Next spring, I’ll try again to encourage another queen bumblebee. It’s been an adventure and it feels right to give a helping hand to a bee that is facing many threats… from habitat loss, pesticides, climate change and disease. Last year we had practically NO RAIN for months on end. Watering our ornamental garden and lawn was prohibited by ordinance. It was a sad situation watching plants suffer with stingy trickles of water saved from rain barrels, from showers, and from our basement de-humidifier. Nothing died but nothing thrived. We’ve had a delightful change this season. Rain was plentiful in the spring. Plants have rebounded and have skyrocketed. It makes my heart sing to seen healthy plants bursting with blooms all summer. I could hardly tear myself from the garden except to come indoors for the night! Good news: the bees and butterflies are back! We’ve had weeks of monarchs and a variety of other butterflies flitting around the garden under the summer sun. We plan ahead for wave after wave of blooms on shrubs mainly, followed by summer flowers to sustain the bees and butterflies. 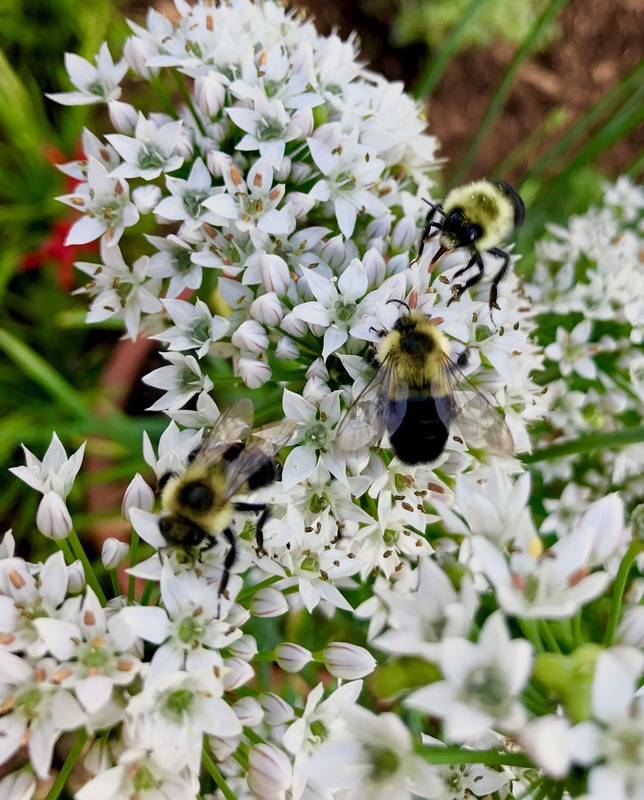 Right now the allium and garlic chives are the strongest insect magnets. We feed the butterflies and bees and we provide hosts for them as much as our small property is able. Here’s a tiny first Instar black swallowtail caterpillar on parsley. With all the turmoil, chaos, and disasters affecting our world, I find gardening and nature to be calming and healing. This small garden of ours gives so much in exchange for so little. It plays an important role giving me great appreciation for the good and beautiful things that still inhabit my life. It is a war zone in my Richmond VA brother’s garden. 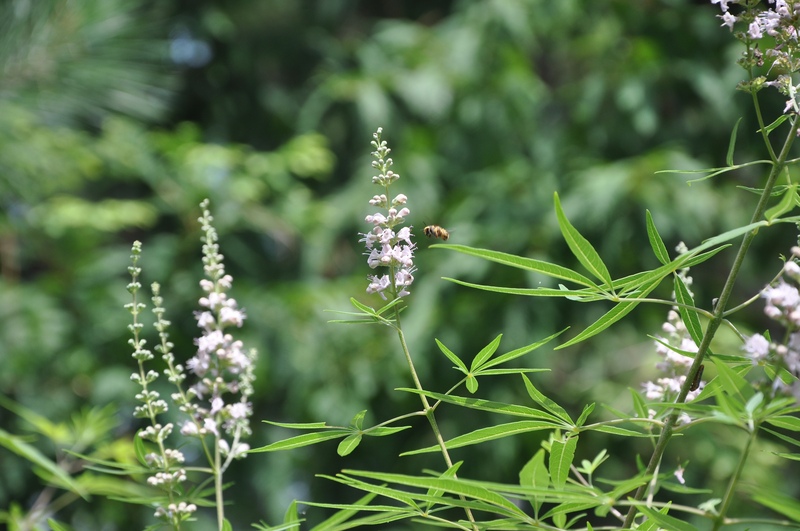 Daily battles… bee vs bee, bee vs man, bee vs dog, bee vs anything that comes too close to its nectar zone… a chaste tree. He summoned his siblings for help with a “HELP IDENTIFY BEE” email full of photos and description of the aggressive and hostile bee behavior. The mystery bee is a warrior bee, yellow and black like a yellow jacket but it’s not, able to maneuver like a hoverbee but it’s not, the size of a small bumble bee but it’s not. With his other bees relentlessly being attacked, battered, bitten, and headbutted, he wanted answers fast. We had plenty of questions and plenty of guesses but it was he who solved the puzzle. It’s a European wool carder bee (Anthidium manicatum), a solitary bee that was accidentally introduced to New York state before 1963 and is named for the fuzz the female collects from plants to line its nests. Claiming a flowering plant as territory just for female carder bees to better his chance of mating, the male carder bee will attack and ward off any intruder it feels is a competitor. And, yikes, that can be humans! Run or be headbutted! With an arsenal of weapons, he can kill other bees, like the honeybee, but from what I read online, this non-native and our non-native honeybee have co-existed for many thousands of years in Europe. Some die, yes, but many are killed by other means. 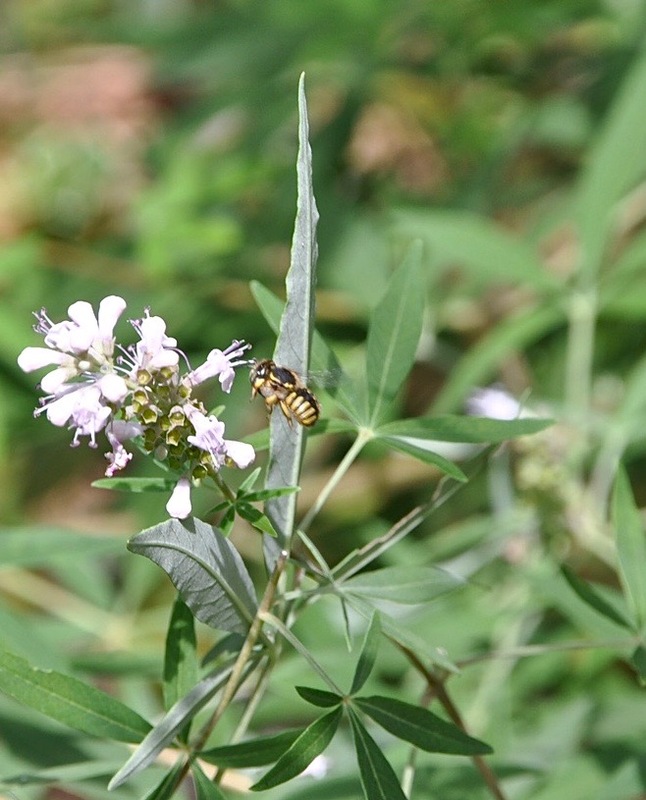 And the good news is… the carder bees are pollinators, too! These male garden bullies are the fiercest warriors in my brother’s peaceable kingdom but I believe he’s taken the view, ‘Live and Let Live.’ Cross my fingers that I don’t see them anytime soon in my New Hampshire garden. I’m worried because I built a cute little solitary bee house in the garden mama carder might like and I grow several plants in the fuzzy Stachy family that she would simply love. If one shows up here, I could always suggest another occupation for this nasty tempered insect. If he grows tired of garden warfare, I think he’d be a shoo-in on Game of Thrones with his wicked temper, his built-in arsonal and his acrobatic agility. In all probability, I think he could manhandle the Mountain a bit better than some of the other challengers! Brown headed cowbirds (Molothrus ater) are called brood parasites, birds that lay eggs in other birds’ nests. It’s said that up to 150 different species in North America are parasitized by cowbirds and the host parents then raise the young. Needless to say, cowbirds are generally looked upon with loathing. Whenever I see this species near our bluebird house, I am out the door clapping and shooing the scourges away. That is until a fledgling cowbird nearly landed in my lap a few days ago. It had been reared by a tiny chipping sparrow and now it seemed abandoned. I watched as it chased every chipping sparrow it saw, more than a dozen around the feeder at a given time. All flew away or scurried to hide when this big baby ran at them, mouth open, flapping wings, and warbling like a baby chipping sparrow. After watching it beg for a day with no food, I broke down and fed it a few mealworms. And now the fledgling flies to me several times a day! That makes me wonder how the heck it can learn to be a cowbird. It is still excited to see a chipping sparrow but absolutely thrilled when it sees me open the door. Hey, you are a cowbird, little guy! I’ve seen cowbirds walking in the grass nearby but our fella doesn’t seem at all interested. With a Google search, I found Matthew Louder, an ecologist, who states in Animal Behavior journal that the juvenile cowbirds leave the host’s territory at sunset, perhaps encountering adult cowbirds in wooded areas, returning to their hosts in the morning, thus fostering independence. But it doesn’t explain how juveniles locate and recognize their own kind. Does our little fledgling fly to the woods when the sun sets to meet up with other cowbirds? We don’t know. But, each day it is standing at the door when we rise at 6 a.m. Fly away soon, little cowbird. Fly far, far, far, far away and never come back to lay an egg in our bluebird box! Something has claimed my beach wormwood (Artemisia stelleriana) and I am happy about it. It’s the larva of the American Lady butterfly (Vanessa virginiensis). 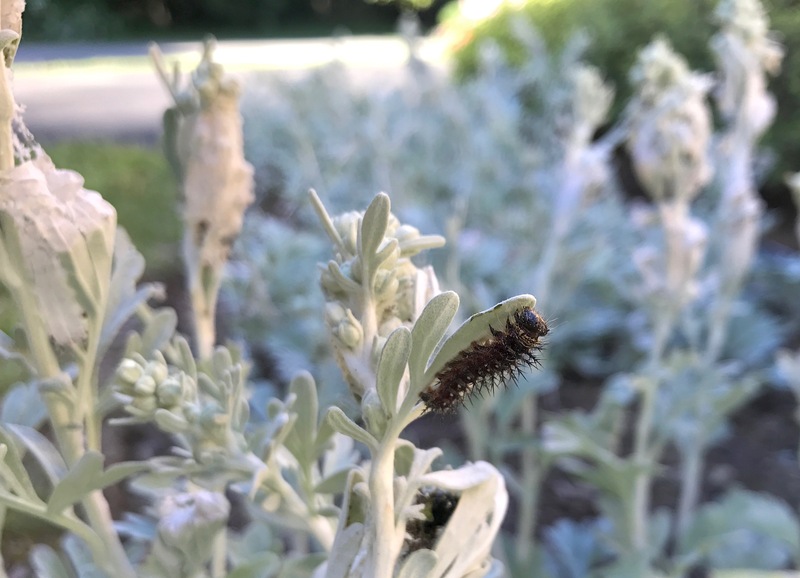 I see all stages of larva development on the plants but the full-grown caterpillar is a wonder to behold. The one below is almost an inch and a half in length and has rows of bristle-like spines, yellow and black stripes, and red, orange, and white spots on each body segment. The artemisia cultivar I grow is compact, growing about 8″ tall and planted along the edge of a border, a great accent with its downy soft silvery leaves. It looks a lot like dusty miller but unlike dusty miller, this plant is a hardy perennial in the Seacoast of New Hampshire. It’s a perfect little groundcover. But this season it won’t look so perfect…. especially at the tallest tips, the blooms. The smaller larvae have spun silk around the bloom tips and smaller leaves. They use these safe hideaways as protection from predators during the day. 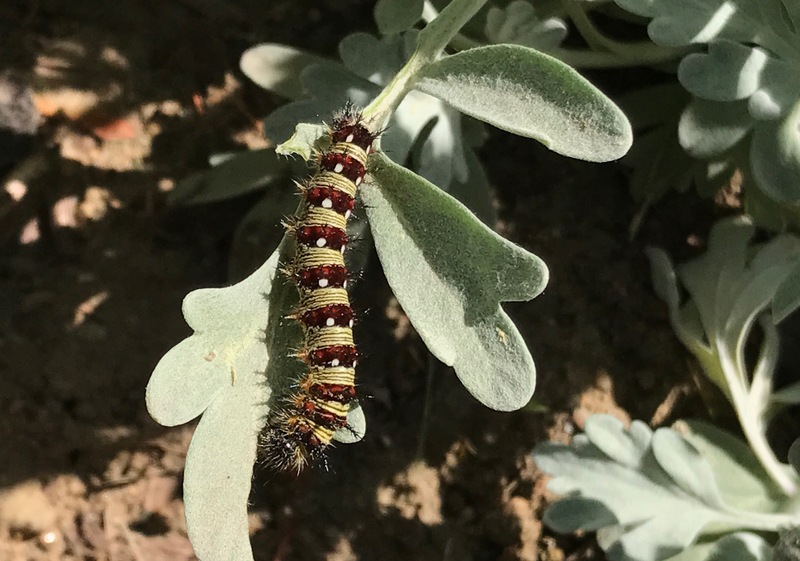 The larger caterpillars have nests lower on the plants. It’s a bit messy inside there, full of excrement or frass. The plants are pretty much covered with larvae, many at an earlier stage of development. I’ll have to wait to clean up the plants after the larvae have developed into pupae, then emerge as adult butterflies. The artemisia will survive. After the butterfly season ends, I’ll heavily trim the ragged plants and new growth with begin to appear. Soon we will be rewarded with the beautiful American Lady butterfly, a medium size butterfly of deep oranges and black spots, closely related to and often mistaken for the Painted Lady butterfly. It lives for two to three weeks during which time it mates and reproduces, starting the cycle once again…. and will eventually begin their fall migration, riding the winds southward just like the Monarchs. Now, where’d I put that soapbox?? Ah, I found it… and now I’m standing on it. It’s about pesticides. Our association sprayed (“EPA approved lower risk”) pesticides again yesterday. They made a wide berth around me, the crazy lady in the driveway holding the pitchfork. Not really, but my hands were on my hips when I told them to skip my house. We were not sprayed. We were told to take away birdseed, empty birdbaths, remove pet items and food, children’s toys, and personal belongings. “KEEP CHILDREN AND PETS AWAY FROM ALL TREATED AREAS UNTIL THEY DRY” So folks took their pets and children inside, shut windows and doors, and waited until the coast was clear. Pesticides like insecticides have become a widely accepted way to keep our homes and gardens relatively pest-free. But how about those animals left outdoors? This week I’m hearing the wood thrush singing the most beautiful melody just inside the wooded area against which they sprayed. It’s an insect eater, and just 20′ inside the woodline is a free flowing stream and vernal pools full of life. A variety of songbirds were hovering in the freshly treated shrubbery looking for our suet and meal worms we removed. The robins were bobbing across the freshly treated lawns and shrubbery around each building searching for worms and insects. My bluebird parents were busy feeding insects to their young in a bird box 50′ from our back door. Bunnies, pesky or not, were most likely sprayed in their nests under shrubs around homes. A variety of bees and other pollinators were buzzing around the newly blooming rhododendron. Around our foundation, I see our toads and the tiny salamanders emerging from hibernation and moving through leaf litter searching for small insects… like beneficial spiders. Our sluggish salamander unearthed in a flowerpot from hibernation. In the garden, growing healthy plants using organic methods is the best pest deterrent. 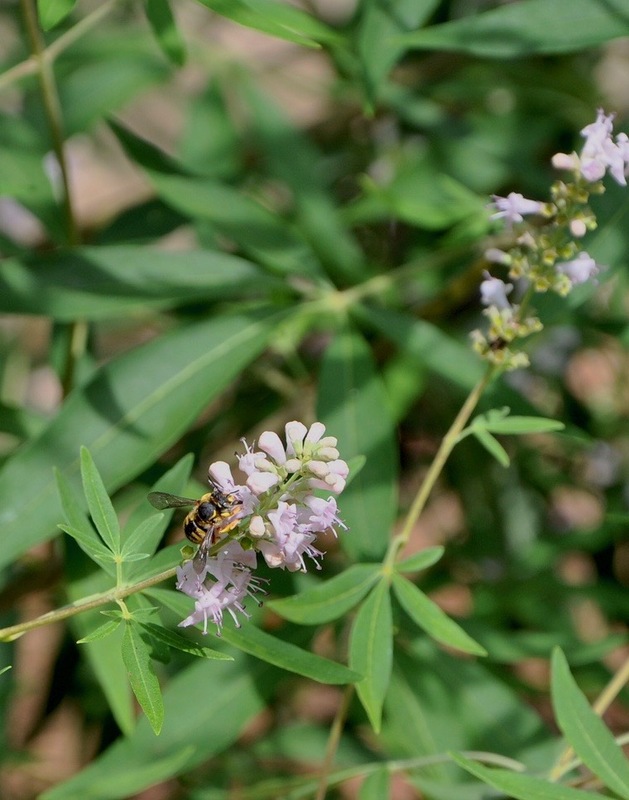 There are a variety of natural pest control methods such as Integrated Pest Management using beneficial insects and remedies like traps and barriers. I don’t want ticks or termites either and, of course, I realize my life cannot be chemical-free. But pesticides should be a last resort. Pesticides are designed to kill. 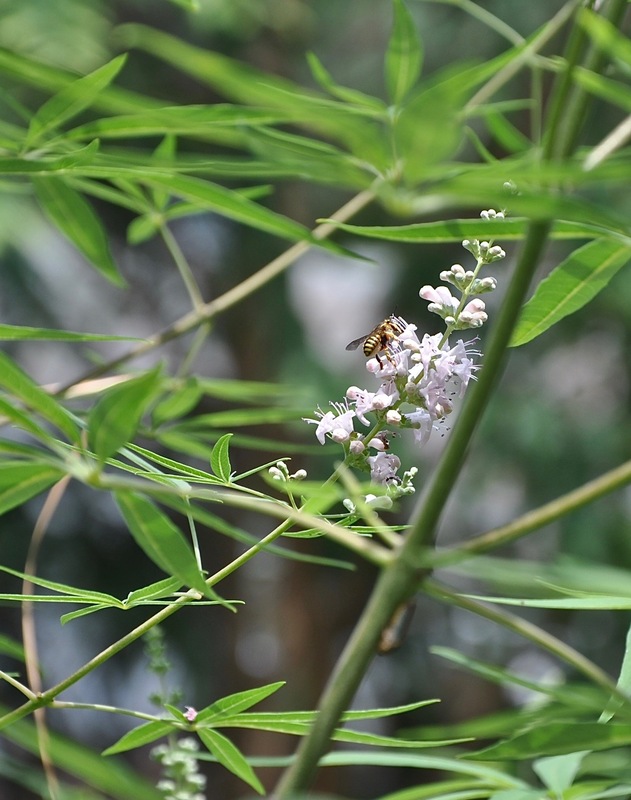 Ticks, termites, and carpenter bees are some of what they want to prevent. But, sadly, most insects are good insects. They become the non-target victims that then become a part of the contaminated food chain. I am not an activist. I simply wish for another way. When an invitation was received by our garden club from RiverWoods Retirement Community in Exeter to join residents for a Arbor Day ribbon cutting ceremony for their new arboretum, several of our members jumped at the occasion. There’s no better way to share our love of trees than attending an Arbor Day event, especially the newest and largest arboretum in New Hampshire. Despite cool temperatures and overcast skies, the event put us in a sunny and festive mood. We were greeted with champagne, a smorgasbord of treats, enthusiastic sharing at the microphone from employees and residents …. including poems for the occasion. Several residents of RiverWoods have been active for years in selecting, planting, nurturing, and labeling trees and woody shrubs on the property so becoming accredited through ArbNet, an Arboretum Accrediation Program developed by The Morton Arboretum, was a natural step. RiverWoods is a Level One arboretum, meaning they must have at least 25 species of documented trees. Already at 49 species, the volunteers and staff have hopes to achieve Level Two with at least 100 species of woody plants, along with other criteria. From the ribbon cutting, we progressed to the walking tour in The Ridge campus where we were led by knowledgeable docent volunteers. Fran Peters introduced us to a number of trees, including the Franklin Tree (Franklinia alatamaha), named for Benjamin Franklin. It has a reputation for being difficult to grow but this specimen tree is very healthy. I must return to see the magnificent blooms it’s known for. Our group continued along led by docent Liz Bacon (l.), who came to RiverWoods from the Chicago area bringing knowledge from the Morton Arboretum. It is she who recognized the potential for a RiverWoods arboretum. Dr. Tom Adams (r.), who has worked with the trees and woody shrubs of RiverWoods for a dozen years, shared his enthusiasm and wisdom with fun tidbits about the trees and gardens including successes and loses over time. His knowledge stems from his volunteer association with the Arnold Arboretum in Boston. The one tree I fell for was the showy Golden Maple (Acer shirasawanum ‘aureum’), a small Japanese maple with lime colored leaves. In the fall, it turns an orange and red like a sugar maple. Yummy! Our garden club members thoroughly enjoyed our afternoon at RiverWoods and we are proud and happy to have the largest arboretum in the state right here in Exeter NH. Way to go, RiverWoods! Go out on a limb. Be content with your natural beauty. They are called periodical cicadas and it’s happening right now in Louisville KY at the home of my daughter. These are the red-eyed cicadas that emerge simultaneously from the ground in 13 or 17 year predictable intervals, according to U. of Kentucky extension entomologist. Only this is a year it wasn’t supposed to happen. I guess no one told the cicadas. The nymphs live beneath the soil feeding on roots and emerge when the soil temperature is warm enough in the spring. They have been exiting the ground by the masses on her property and will continue to do so for a couple more weeks. She first noticed the empty shells all over the ground one morning. Most were empty but some nymphs are unable to extricate as you can see the wing of the partially open shell. After leaving the ground at night, they slowly make their way up any vertical surface and molt into adults, a prolonged overnight process. I’ve spent many a night as a child watching the annual cicadas, a different cicada, slowly struggle out of shells, and pump their wings out straight. In the morning, shells will be hanging from a multitude of surfaces and lying all over the ground. Most of the adults will have flown but some may still be there until their wings have fully expanded and dried enough to fly. It’s an amazing process to watch. The males are the ones you hear singing to attract the females. The adult cicadas will mate and the female lays eggs in small tree branches. The eggs will mature for weeks, then hatch and fall to the ground, where they burrow and start the cycle over. Cicadas don’t bite or sting and are fairly benign to adult vegetation and trees….. rarely causing damage, unless you own an orchard or vineyard where they could possibly inflict some monetary damage, states the extension service. Generally, what follows is a smorgasbord of food for insect eating birds and mammals. It’s nature’s way…. So happy that the last day for frost in New Hampshire has arrived! There is some bad news in the garden but lots of sweet discoveries of rebirth. We won’t be lighting fires or dancing around a maypole with ribbons, a popular event of my childhood, but will be celebrating the fertility and merrymaking in the garden. The hummingbirds returned yesterday. The bees are back. All over the Seacoast, we see the cold hardy, early blooming PJM rhododendron hybrids with their bright lavender-pink flowers attracting bumblebees galore. I keep a small one just for those early blooms for insects. 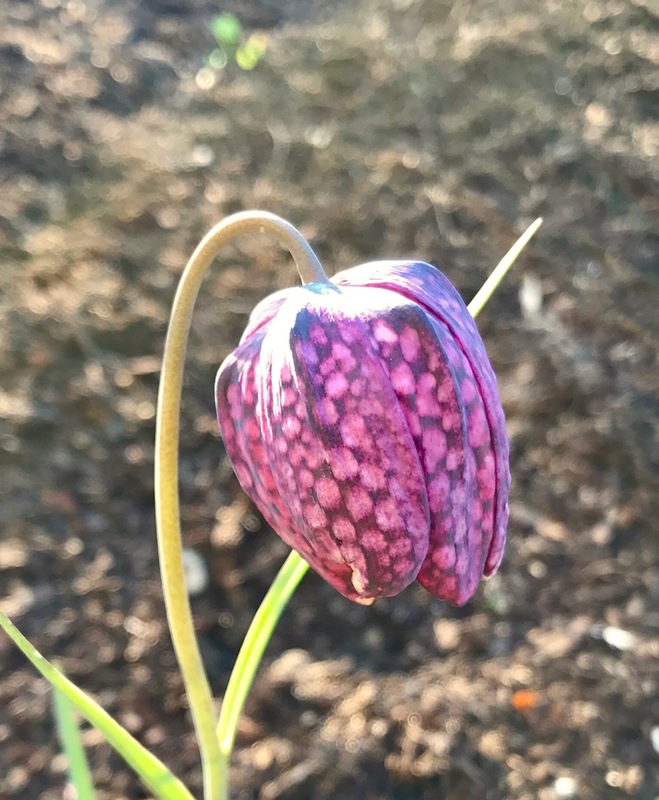 Tulips, daffodils, and grape hyacinths are providing the most booms in our garden at this early stage of spring but we also have the pansies struggling to set blooms. Good news is the New Hampshire drought is over on the Seacoast. Fingers crossed for good rainfall for the summer. 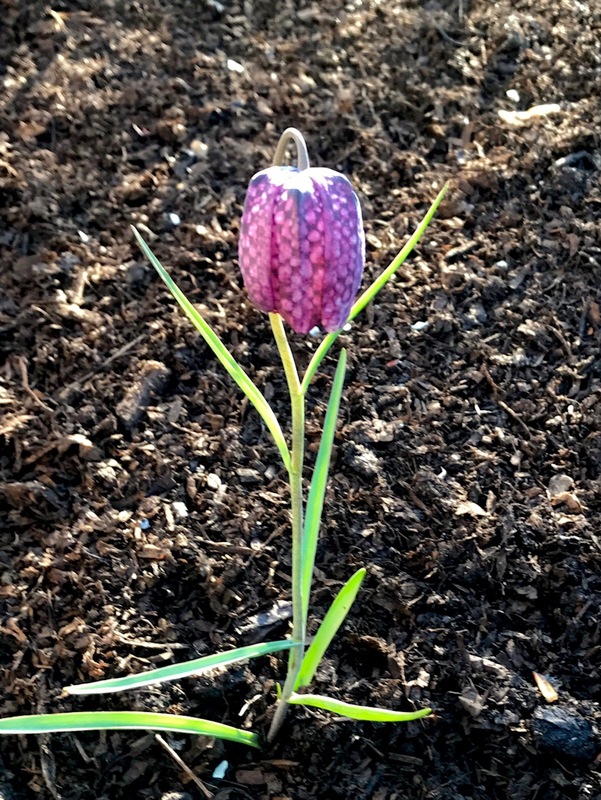 The cutest little bulb in the garden is the Fritillaria meleagris, the miniature checkerboard lily. 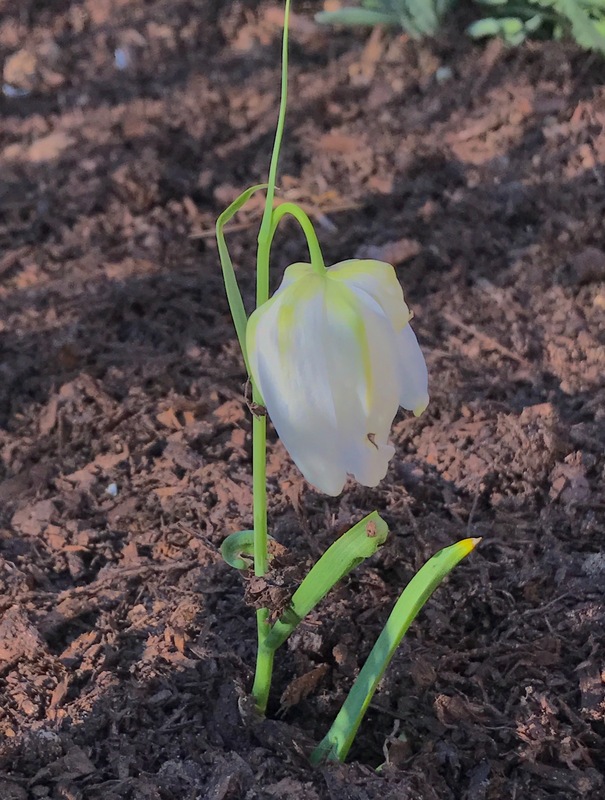 I planted 15 bulbs but only 6 appeared both in white and in an adorable purple faint checkered pattern. Yes, I will plant more of these… and maybe have a fairy garden someday. In the shade, the common bleeding heart (Dicentra) is unfurling its tiny cluster of heart-shaped flowers along stems and the Epimedium grandiflorum ‘Yubae’ is performing well in its second year. My favorite color in the garden is green and we have plenty of that. Leaves are unfurling on viburnum, hydrangea, hosta, serviceberry, aucuba. It is the true color of spring…. a reward of rebirth and growth. Green provides me with a sense of relaxation and well-being and if I am surrounded by green whether in my landscape or beneath a canopy of trees in a forest, I have my sanctuary. Oh boy, was it fun to connect with my “roots” in Virginia for several days. My adorable niece was married last Saturday in Richmond. mister gardener and I flew down for the lovely event and extended our stay to catch up with family (and plant life) just below the Mason-Dixon Line in the Piedmont area of Virginia. The horizon was totally green under hazy skies as we descended for landing, trees fully leafed out, green, green, green, way ahead of the landscape in New Hampshire. That always amazes me. It’s just an hour and 20 minutes by plane. We generally drop our luggage at the home of one of my brothers and wife in Richmond…. a couple who always make us feel right at home in their beautiful 19th century home that they have lovingly restored… all by themselves for the most part! And first things first…. the most gracious Virginia hospitality includes what we have been craving…. Edwards Virginia Ham on warm buttered biscuits! Edwards Ham is the salty type, a country ham that perhaps will seem too salty if one hasn’t grown up with it as a staple in the home. As for me, this wonderful ham has spoiled me for any ham I’ve tasted since. Sadly, this unique Surry, Virginia ham company burned to the ground a year ago. While the insurance is being settled, the ham is being prepared and aged at other ham facilities across the country. Lucky for us! Another priority in the south before you are unpacked and settled is a garden tour. This is a brother and wife who love and live just to be in the garden. I blogged about their gardens a few years ago. This is also the brother who saved the crow and that was quite an exciting story! Those blogs are two of my most read blogs and most ‘lifted’ photos from my blog… (that I willingly share if given credit for them). The garden house my brother built from his own design (and where he hid from the attacking crow) always receives a lot of interest. For sure, he missed his calling as an architect. He is amazing and that’s no exaggeration from this sister! The garden house looks great from any angle, even our bedroom window. It’s fun on each visit to see what’s new in this fabulous garden. I told a blogging friend who photographed a door in another garden, that I knew a person with a garden door and this is the place! The fence and an old door were added to stop the deer from nibbling the azaleas. What a great garden accent! I love the RED. Everywhere you look there is nature looking back. I loved this sweet scene beneath the pergola he built last summer. It is covered with a lovely purple wisteria where wrens live in the house and robins are raising young practically on top of the wren house…. sort of condo style. What will we look forward to on the next garden tour? They are planning another outhouse in the garden. This small one will be for the mower, weed eater, and blower. He’s already begun the foundation using discarded lumber from a neighbors deck. “What will it look like?” I asked. It will be a chip off the other garden house and he sketched it for me in a flash. The roof will be tin and atop the weathervane will be a copper bird dog, our family’s favorite pooch. I can hardly wait for my next visit…. We have a family of Eastern bluebirds (Sialia sialis) that is staying with us through the winter. The blues have been expanding their range for the last 10 years or so, and it’s not really unusual to see them in New England during the winter. Two springs ago, mister gardener made a bluebird house and installed it along the edge of our garden. It wasn’t long before a pair claimed the house, fighting off chickadees, house sparrows and swallows for this real estate. During the summer, the pair fed on a variety of foods that they found in the landscape and we supplemented with a little snack of meal worms. They only had one nesting that summer and the family wintered over. In the spring, the young were off to find their own territories and our parents managed three nestings last summer. So we have our original pair and 4 of the offspring wintering over this year. We have planted shrubs and trees that also provide food… such as serviceberry, viburnum, crabapple… for the fall when insects become more scarce. To help them out during the winter, we feed them meal worms but make sure we offer a mixed and balanced diet by adding bits of suet, hulled sunflower, and some berries and raisins. Bluebirds love to bathe! A heated birdbath in the winter is a plus for bathing and drinking. The blues generally roost at night in nearby pine forests, but will huddle in their bluebird house for shelter from time to time. When I look out on snowy mornings and there is hardly a place for them to land, I wonder what these birds might be thinking. Could they be questioning their decision not to migrate to warm climes? Just maybe…..
We are blessed with a multitude and variety of birds that frequent the winter feeder but, alas… these unruly mourning doves, beautiful as they are, have overwhelmed the feeder during Great Backyard Bird Count this weekend. There are only 6 on the feeder pictured here but sometimes there are six more standing on the backs of those feeding…. all jostling and shouldering their way to a little sunflower seed. The rest of the mob is on the ground pushing and shoving for spillage. They are fast eaters and can clean the feeder in record time, fill their crops, and fly off to digest their meal. Not all doves migrate and the ones I see could be sticking it out for the winter or they may be the males arriving way too early for the best breeding territory. 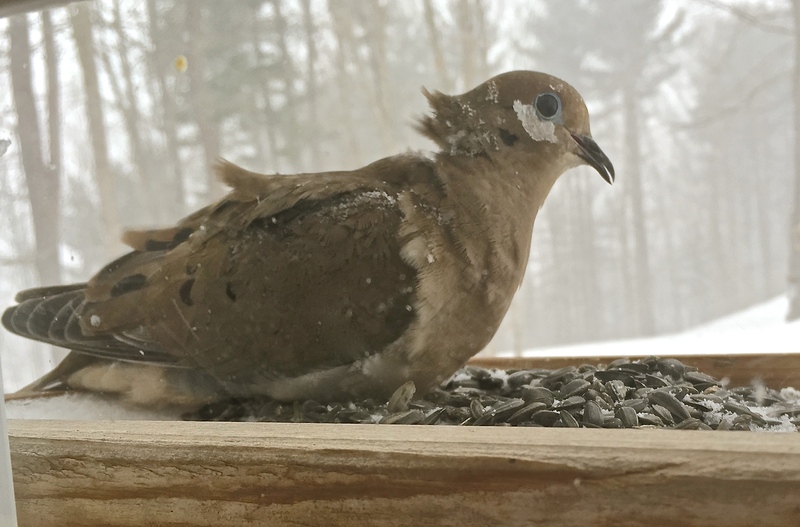 Although New Hampshire is one state that does not allow hunting of doves, it’s still a tough life for the birds that stick around all winter. I have seen frostbitten and missing toes… and feathers on the snow tell me they are a link in the food chain for birds of prey. The diversity of birds in our weekend count will not be as great this year, but we will continue to welcome these gentle birds to our feeders. Up in the Lakes Region of New Hampshire and places north, they call folks from our area and beyond, Flatlanders or “flatlandahs,” as it is properly pronounced in New Hampshire. I was well aware of the label as we ventured into the beautiful Lakes Region for a little R&R last week, but, thankfully, locals were way too polite to use the term when they inquired where we were from. I know what they were probably thinking as we snapped photographs of every fern, mountain, shop window, and covered bridge. No moose though. Two black bears…. a live one crossing the road and a stuffed one at an area restaurant. It was a great time to travel there. Crowds gone. The highways were navigable and only the locals in the shops and restaurants. We were between summer tourist season and Leaf Peeper season. The camp where we stayed was practically unpeopled and so very natural. No motors… only the sound of paddles dipping in the water. Blue skies. Gorgeous sunsets. There were six of us and about 6,000 pickerel frogs, a resident snake, one noisy chipmunk scolding us during the day, the piercing rattle of the Belted Kingfisher giving us morning wakeup, and the echos across the pond of loons to lullaby us to sleep at night. More fun than anything was watching the little ones enjoy the ‘wilderness’ adventure. Meals were easy. Deserts were often over a fire. Our lodging was beautifully rustic, yet modernized… thank goodness. The atmosphere gave me a sense that Katharine Hepburn or Henry Fonda could walk in the door and settle down in front of the towering stone fireplace. Family albums on the shelf, family pictures through umpteen years on refrigerator, walls, and tables. Scratched wide plank flooring most likely has withstood generations of canines that were captured in old photographs. Collection of hats for any occasion adored a wall. Great ambience! We’re so glad we were made very welcome in our camp and in the numerous towns we visited. Without a doubt, we came home refreshed and already babbling about our next trip. What’s round on the ends and HI in the middle? The great state of O-HI-O! Ohio is where my 4 children and 7 of my 8 (soon to be 9) grandchildren from 3 states gathered for our annual hiking vacation. With a son living in the east-central part of the state, 14 of us converged there to laugh and tell stories, plan outings, to cook, eat and sleep in a rural setting surrounded by woods and farmland where wheat and corn dominated every horizon. We accomplished our annual hike perfectly while keeping up with a son’s rigorous itinerary. We visited the stables where his daughters’ ponies were put through their paces for us, met the barn cats, and shared in pony grooming complete with treats. We shopped the vibrant and beautiful Wooster, Ohio. Meals were simple and delicious. We ate well. Deserts were simple, too. Either s’mores over a fire pit or our annual blackberry dessert with hard sauce or Kentucky Derby Pie. Local blackberries weren’t available but black raspberries were sold from an Amish neighbor’s garden. This area is home to the world’s largest Amish community. Great neighbors! Our hike took place at Wooster Memorial Park, also called Spangler Park, owned by the city of Wooster. Over 320 acres and 7 miles of foot trails up and down steep ravines, through lush woodland, scenic overlooks, and far stretching farm fields loaded with wildflowers. Days slipped by quickly and before we knew it, it was time to pack up and return home… but not before one last celebration: a monumental firework display to celebrate our happy family gathering. Well, it’s that time of year again…. time for me to become a citizen scientist and count birds for a minimum of 15 minutes a day during this 4-day weekend, February 13 – 16. Then report my findings at birdcount.org. It’s easy, it’s free, and it helps avian researchers have a real-time picture of how birds are doing. There are two days are left in the count… today and tomorrow. Just Do It! Near the feeder, it’s an easy task but in other locations, it can take a bit of concentration. 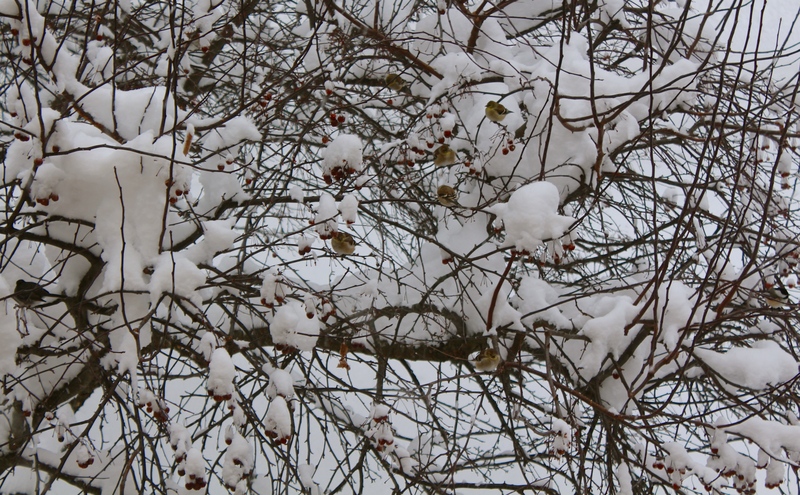 Can you spot the lone chickadee among American goldfinches and a junco in the crab apple tree? Click to enlarge.